Early peoples knew the sky well and made many observations with their naked eyes. Each group had its own myths about the things in the sky. Their "cosmologies" were not drawn from reasoning about what they saw, but were stories about a moral universe. Nomads in the Sahara and tribal peoples in the American Southwest used stones to mark important celestial events like the summer solstice (the day the Sun ceases to climb higher at each noon). When people began to depend on agriculture, they needed to know the exact course of the seasons to help them decide when to plant and harvest. Ancient Egyptians, Celts, Mayans and others built colossal stone structures, precisely aligned to the seasonal risings and settings of the Sun, Moon, planets, and some bright stars. Early astronomers used many kinds of instruments to study the heavens. All were basically tools for measuring or calculating the positions of objects in the sky. With them astronomers mapped the stars and made tables to predict the future positions of the Sun, Moon, and planets. This knowledge was important, for the sky served as a clock, a calendar, and a navigational aid to help seafarers find their way. It was used by priests to set the time for religious observances and by astrologers to cast horoscopes. in 1577, it was soon torn down under suspicion of impious astrological investigations. The ancient Greeks learned to make precise instruments, crowned by the ingenious astrolabe. This hand-held device had a moveable arm to measure the angle of a bright star above the horizon — the star's "altitude." Rotating a metal map of stars to match engraved curves, the user could determine time and direction, locate stars in the sky, determine when the sun would rise or set, and make other calculations. Astrolabes reached their standard configuration by the fourth century, having been first developed in the first or second century near the Egyptian city of Alexandria. The example shown here is Islamic and dates from the 11th century. Astrolabes were especially important to Muslims who used them to determine the proper hours for prayer and the direction of Mecca. This astrolabe has several interchangeable plates, each engraved with the celestial coordinates for a different latitude. The pointers on the top plate indicate the positions of twenty-two bright stars. The top plate can rotate to show where those stars will appear at different times or dates, much like a modern paper or plastic star finder. The instrument could also be used to predict when the Sun or certain bright stars would rise or set on any date. Modern depiction of the observatory Al-Tusi built at Maragha, Persia in 1258. Funded partly by religious endowments, it attracted scientists from as far as Spain and China. 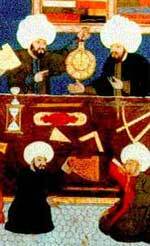 Islamic astronomers made careful observations to improve Ptolemy's planetary and stellar positions. Notable observatories include those at Maragha, in north-west Persia (Iran), constructed in 1259 and staffed with renowned astronomers who came from as far as China and Spain, and at Samarkand in central Asia, built around 1420. The bigger such a structure was, the more accurately an observer could measure the positions of planets and stars. Princes supported such works partly because patronage of arts and sciences reflected glory upon themselves, and partly for more accurate astrology, which was not then clearly separated from genuine science. This medieval German quadrant could be used for navigation or as a sundial. The earliest devices for "sighting the stars" were crude sticks. Seamen improved these, arriving at a quarter-circle ("quadrant") marked off in degrees, with a sighting arm to measure a star's altitude. Eventually the quadrant was replaced by the sextant (named after one-sixth of a circle, it is actually one-twelfth, doubled with the aid of a mirror). A sextant was the inseparable companion of every navigator until the invention of electronic positioning systems in the late 20th century. Astronomers also used quadrants to map the positions of stars and planets. The instrument in the picture is a rare example of especially ingenious medieval European instrument-making (ca. 1325 AD). 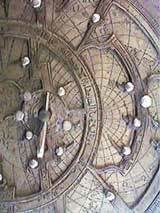 The sighting arm rotates across a pattern made by folding the circular face of an astrolabe into quarters. The user can not only take star sights as with a quadrant, but make calculations as with a simple astrolabe. Essentially, the circular face of an astrolabe has been "folded over" twice to create a quarter-circle. This instrument could serve as a measuring tool and perform many of an astrolabe's calculation functions as well. Full-scale replica of an armillary sphere built and used by Danish astronomer Tycho Brahe in the late 1500s. Armillary spheres large and small were used for centuries to study the sky and to teach about the celestial coordinate system, which astronomers used to locate objects in the sky. They were composed of rings (armillae) which represented the great circles of the celestial sphere. Shown here is a full-scale replica of an armillary sphere built and used by Danish astronomer Tycho Brahe in the late 1500s. An observer would use its moveable rings and sighting devices to measure the position of a celestial object or differences between the positions of two objects. The larger the naked-eye instrument, the more precisely it could measure angles. A mural ("wall") quadrant was a large 90-degree arc attached to a north-south wall, with a sighting tool to measure the altitudes of stars and planets. The most famous mural quadrant in Europe was built by Tycho Brahe in the 16th century as part of a grand observatory supported by the King of Denmark. In this picture, an observer at far right slides a sighting device to line up with a star that he sees through a slot in the opposite wall. At the moment the star is seen due south, he announces its altitude angle. An assistant below him announces the time, and another assistant, sitting at left, writes down the numbers. 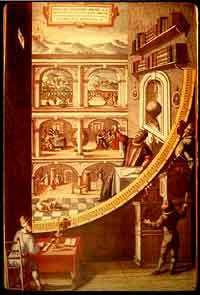 Behind the quadrant is a painting of Tycho and his assistants at work elsewhere in the observatory. With his mural quadrant and other naked-eye instruments, Tycho recorded the positions of hundreds of stars and followed the motions of planets over decades. His mass of data was invaluable for later astronomers. Tycho's measurements were the most accurate ever made until telescopes came on the scene.